Saturday 11th August 2018, ko 3:00pm. Bournemouth manager Eddie Howe says record signing Jefferson Lerma is not yet ready to make his debut following his World Cup exploits for Colombia. Nathan Ake has been passed fit, but Diego Rico is suspended and Junior Stanislas and Kyle Taylor are injured. Cardiff signed midfielder Harry Arter from Bournemouth on Thursday, but he is ineligible for this game due to the terms of his loan deal. Alex Smithies, Josh Murphy, Greg Cunningham, Victor Camarasa and Bobby Reid are all in contention to make their Bluebirds debuts. "It is human nature - when you finish ninth, you want to finish higher the following season. "And when you finish 12th, you want to finish higher and I think that will be in everyone's head. "But for us, looking at league positions is a waste of time and energy. We have to focus on our performances and make sure we are improving as a team every single day." "Their front four is as good as anything in the league - the two wide players and the two strikers. "It’ll be a big test for us but I think we should just go in there with an open mind. "We know it’s going to be hard but we’ve got to do the best we can and learn quickly." 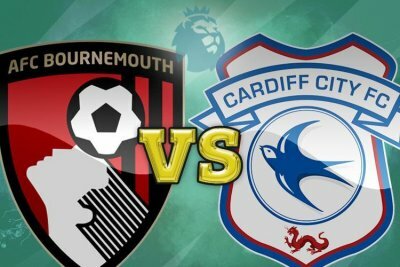 Bournemouth have lost just one of their last eight league clashes with Cardiff (W4 D3), with their last meeting coming in March 2015 in the Championship (1-1). Bournemouth have lost all three of their matchday one Premier League fixtures, the worst such 100 per cent losing record in the competition. Cardiff have lost just one of their last 10 opening fixtures to a league season (W5 D4), though this came in their only previous Premier League campaign (0-2 vs West Ham in 2013-14). In their previous Premier League campaign, Cardiff won just two of their 19 away games. However, one of those wins came on the south coast (1-0 vs Southampton). Bournemouth have never lost a Premier League home game against a newly promoted side, winning six and drawing two of their eight matches. This will be Cardiff manager Neil Warnock's first match against Bournemouth since October 1999 when he was Bury manager (2-2 in the third tier). In total, he's won five of his 10 previous meetings with the Cherries (D4 L1). Bournemouth boss Eddie Howe has never lost a league game against Cardiff as manager, though five of the six previous meetings have ended level (W1 D5 L0).